The rugged Chop Hills that make Ballyneal one of the top golf courses in the country are now home to a premiere American upland hunting experience. Ballyneal is set in the midst of thousands of acres of native grasses; as well as fields of corn, millet, and sorghum that provide a perfect nesting environment for dozens of varieties of wild birds, dominated by the trophy Chinese ring-necked pheasant. Ballyneal offers exclusive access to this hunting land plus knowledgeable, professional guides and gun dogs that will make your hunt a world-class experience unlike any other. Ballyneal offers preserve hunting experiences October through April. The preserve hunting is on Ballyneal land either in or adjacent to the Chop Hills. 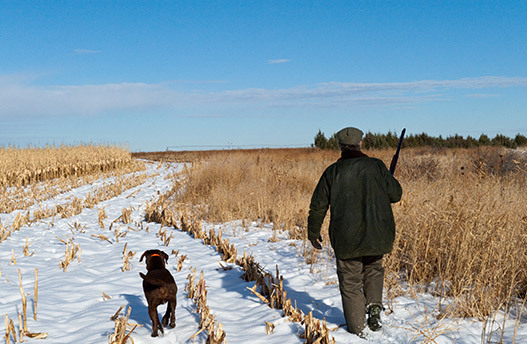 These hunts are for released ring-necked pheasant and include the same quality guides and birds. Ballyneal Hunt Club is open to the public and Membership is not required; however Ballyneal Members receive preferred access and rates. Hunters are not required to have a license for preserve land hunts. No matter your experience or skill level, Ballyneal Hunt Club has plenty to offer for everyone. For further information regarding hunting experiences at Ballyneal Hunt Club, please fill out the following form or contact our concierge team at (970) 854-5900 ext. 1. We will respond to your inquiry as soon as possible. Happy hunting!